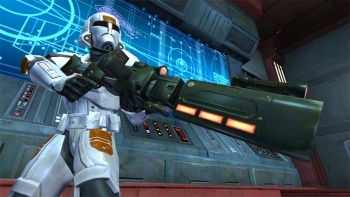 For those of us who prefer to bring a blaster rifle to a lightsaber duel, there's the newest revealed class from Star Wars: The Old Republic: The Trooper. Beam swords that can slice through anything and make cool whoosh-whoosh noises are totally overrated. Give me a suit of body armor, a gun that goes pew pew and maybe some explosives and I'm good to go. Forget playing as a Jedi in BioWare's new Star Wars MMOG, The Old Republic. Give me the common man's fighter. Give me The Trooper. "These Troopers are the embodiment of the Republic military's highest aspirations-the most advanced fighting force in the galaxy," BioWare writes of the class. "They are equipped to face any foe in any environment, but it's not their gear that makes them tough-it's their guts." Their gear looks pretty nice, too, though. In addition to armor suits and big guns, The Trooper also comes battle ready with a grenade launcher, sticky grenades (getting some major Halo vibes here) and of course, the blunt end of his/her rifle, which will always do to knock some jerk out stone cold. "Whether storming a base or a battlefield, the Trooper charges into the fight, blaster-rifle blazing, to clear a path for freedom and justice," BioWare writes. They also note that the class does well in squads but is more than reliable in solo play.